We stayed at this hotel for 2 weeks the beaches are clean,the hotel was i need of selected repairs but on the last day we were told it is closing down in june 2009 for refurbishment work,the rooms were basic but nice,the food was not the best much of the food was put out for breakfast from the night before,the staff were very rude you could only have wine or juice with your evening meal,the hotel in my opinion does not cater for british tourists,no international spirits were available,the blender for the cocktails was broke for 2 weeks many of the british tourists seemed to go to the blau hotel or iberostar varadero hotel which both looked really nice. We got moved last minite because of ike so did not really have alot of time to get info on this hotel. I was very impressed from the moment we arrived the staff were great reception quick and we were on the way to the room. The hotel had just gone through 2 days of heavy winds but you never would have guessed it was immaculate from the rooms to the beach, spotless. I am a fussy eater but anyone who says the food was no good here i would like them to explain, i ate like a king for 2 weeks from soup to carvery it was wonderful and the service was great also in the restaurants. You can eat all day and all night, even the pool snacks were good. One major item i will bring your attention to is the drinks nothing bad, i was drinking top quality malt whiskey, the missus on the baileys, mailibu, you could have there brands which were good the ron varadero rum very nice indeed, but to see uk brands was a plus. The location gets a 4 because its nearly at the end on the peninsula if you are on a trip your be last off and the drops get abit much but its a straight 45mins transfer from the airport. You can get the red open top bus for 5 pesos all day 24hrs and get on and off when you like its great for going into town or the playa las americas shopping mall. Be careful about sitting on top the hot sun is very decieving. The entertainment gets a 5 mainly because there were cuban bands on every night from 8.15-9.45 music and dancing. the actual hotel theatre was so so, put together as best they could the acrobats were very good and theres also a bar. During the day by the pool we had fashion shows, bingo, competitions of various kinds winner gets a bottle of rum. If you are a bit of a night owl at 11pm the club opens till 2 im a bit old now but took a look and it was full people enjoying themselves, plus another bar get a drink and sit outside if it takes your fancy. Then after that nip down to the bucanero for a burger and another beer if you like. We will go back to Cuba again not here, but to the cayos where we should have been just to see if we missed anything. We had read reports on this hotel on other websites which are very mixed so went with an open mind. However we were really pleased we chose this hotel. The check in very quick. Room ok, but afew things didnt work so the next day we requested a different room, which was delt with straight away. the rooms are huge, clean 2 double beds a bath and seperate shower. All the staff every helpful and pleasant. The hotel itself was lovely. The food repetative, and abit bland at times, but that is Cuban food for you. All in all a great holiday and I would definately stay at this hotel again. 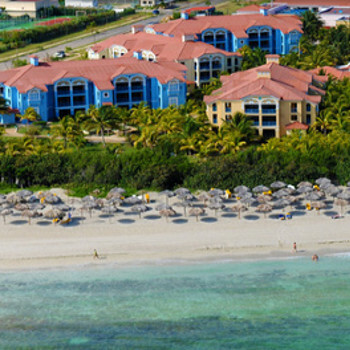 The hotel is amazing its in a prime location the beach is directly on your doorstep and the beach is breath taking!!! The hotel is all kept immacutaley clean and towels and beds made daily. The food is ok but gets a bit repetitive but if you love fresh fruit or meat you''ll be fine. Alcohol is available 24 hours a day and there is nightly entertainment at 10pm and the dancers are great. Forget the hotel nightclub and go with the staff into Varadero and experience a Cuban night out which is great and lastly do the Havana over night. If you don't have kids with you its great.